With this new recording, Decca has pretty much sewn up the market on three generations of outstanding Bohèmes. Tebaldi and Bergonzi (still my personal favorite) represent the 1950s, Freni and Pavarotti represent the 70s, and now Gheorghiu and Alagna take us into the new millennium with a recording that ranks among the very best. Only de los Angeles and Björling (on EMI, conducted by Beecham) can really compete with these three recordings. This may be Riccardo Chailly's finest work on disc. I have a hundred-minute rule about Bohèmes: if the total timing is shorter than 100 minutes, then the tempos are too fast. As can be seen from the headnote, Chailly times in at 99:49. Although his tempos are often faster than usual, Chailly's sensitive phrasing and alert rhythms win me over in spite of my rule; I know slower readings that sound more hectic than this one. It was fortunate that this recording was made with the Orchestra and Chorus of La Scala because they have this opera in their blood. Together, they and Chailly make this a Bohème that would be worth hearing even if the soloists weren't so fine. 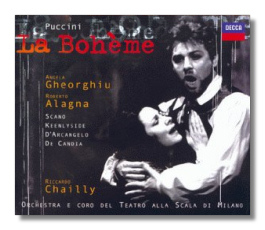 Gheorghiu and Alagna, a real-life couple, pour their hearts into the lead roles. Neither is the most distinctive singer or blessed with the voice of the century, but they participate in a curious synergy that makes this recording much more than the sum of its parts. Alagna is blustery at times, but the climax of "Che gelida manina" is gorgeous, and his boyish interpretation is very winning. Gheorghiu's voice is thick and dark, and she uses it with skill. In "Mi chiamano Mimì," she slides into the phrase "Ma quando vien lo sgelo" without taking a breath, an effect that I always find electrifying. Her assertive characterization works well, and does nothing to diminish the character's pathos. Together, they are incredibly stirring. The subsidiary pair of lovers is hardly less attractive. Keelyside's Marcello doesn't imprint itself on the memory as others' do; nevertheless, his sound is Italianate, and he sings ardently, especially at the climax of Act II, as Musetta is making her successful bid to win him back. Scano is a soubrette Musetta, but a brilliant and lovely one with genuine sparkle. Few could resist her waltz song. The other Bohemians are well sung and vividly portrayed. Veteran Alfredo Mariotti has a grand time as both Benoit and Alcindoro. Mariotti studied under a vocal coach named Luigi Ricci, who in turn worked alongside Puccini during several productions. Indeed, the composer seems uncannily present throughout. Chailly has used Francesco Degrada's 1988 critical edition of the score to prepare this recording. Most of Degrada's changes (based on Puccini's original materials) are subtle, but dozens of subtle changes add up to a reading that sounds scrubbed clean. For example, it is wonderful not to hear Rodolfo shrieking out a high C at the end of Act One. Here, following Degrada's edition, Alagna ends on E, a much more romantic and gallant way to bring down the curtain. No recording is perfect, but this Bohème's imperfections are so minor that they are not worth mentioning. I give this new addition to the catalogue my highest recommendation, and it has been a very long time since I've said that about a new addition to the discography of basic repertoire operas. Hear this – this is a Bohème for today and every day.